I first became aware of the Craft Film Festival a couple of years ago through Fred Ambroisine. As is not so unusual among cineastes and filmmakers, connections can be roundabout. Depending on which festival he is with, Fred can be a photographer, videographer or involved in the programming. I met Fred at the Far East Film Festival in Udine, Italy, five years ago. His Facebook postings about the Craft Film Festival got me intrigued. As it turned out, reading the festival's website did not prepare me for the changes of their third year. 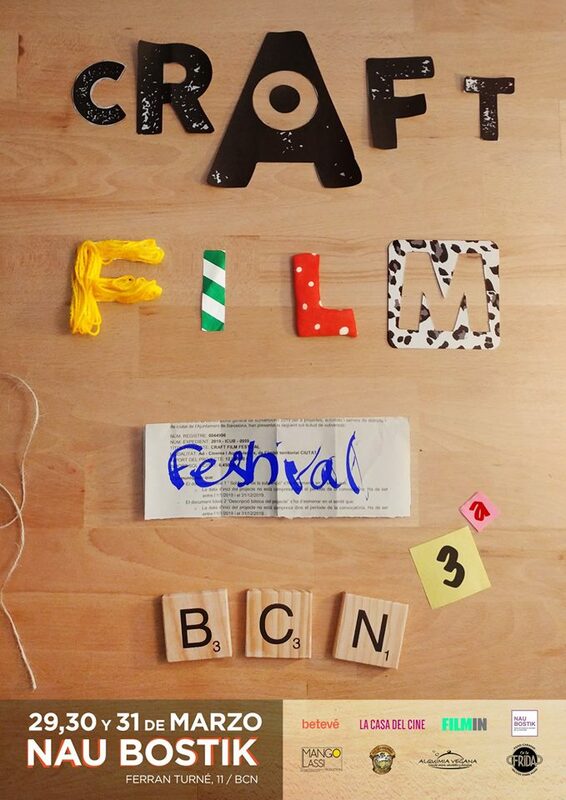 Based in Barcelona, Spain, the first big change was moving the festival from a movie theater in a more commercial part of the city to Nau Bostik, a former glue factory turned cultural center, located in the quieter, residential section of the city known as La Sagera. Unlike the past years, there was a heavier presence of Spanish films. Also, ironic at a time when there is a demand for film festival to display gender balance, only two of the the eight selections were directed by women. There is something to be said for the move aligning the festival with its do-it-yourself ethos to a more casual location. Held during the last weekend of March, relatively warm days were replaced by cool nights, with the screening room finally getting heat on Sunday. It also may be a reflection on my being old and fat, but those narrow canvas chairs were uncomfortable for an extended period. Consider some of my concerns part of the festival's growing pains. The downside of the cold screening rooms was that I felt ill following the first screening on Saturday night. Of eight films, I saw five. Of the five films seen, the two Spanish films had English subtitles. The other three films had Spanish subtitles. I don't speak Spanish, though I can recognize some words. I do like to think that I speak Cinema. The opening night film, Tungstenio still resonates with me. Seen in Brazilian Portuguese with Spanish subtitles. Heitor Dhalia's film is full of dynamic images. At one point, a scene was filmed with the widescreen camera lens positioned vertically, for a temporarily disorienting moment. I undoubtedly lost some details and nuances along the way, but essentially the film is about one very bad cop, Richard, and his volatile relationships with the world, including his wife. With much of the action taking place on a dilapidated beach in Bahia, the viewer isn't even certain if Richard actually is a policeman, or just a guy with a gun. Among Richard's targets are a couple of guys trying to get by with dynamite fishing. Dhalia and writer Marcal Aquino keep things going at a trim 79 minutes. What I also liked was having the opportunity to see a different kind of Brazilian film, away from Rio and Sao Paulo, and neither exotic nor particularly humanistic. I would encourage the filmmakers to consider an alternative title for H0US3, if only to not get their film confused with the several other similarly titled films. Seen in Spanish with English subtitles. A low budget sci-fi thriller that mostly takes place in one room. A reunion of college computer nerds slowly builds up after establishing the basic premise - a specially encrypted file has been found in Wikileaks, and their are suspicions regarding the contents. Almost sixty years after Kiss Me Deadly, the Pandora's Box is an online entity, while the curiosity about what's inside has not changed. Manuel Munguia and his team make effective use of limited special effects. Once the major plot twist kicks in, the narrative becomes riveting, especially during moments when reality gives way to virtual reality. I would hope H0US3 finds life in other film festivals. Curiously, the two films by female filmmakers originated from countries that were satellites of the Soviet Union, and have stories about the effects of the changes when several eastern European countries declared independence and the two sections of Germany reunited. Natalie Saufert's Resentment takes place in Moldova during the Transnistria War in 1990, a conflict that was generally ignored by western news agencies. Transnistria is a stretch of land on the border between Moldova and Ukraine. Galina is thirty, alone, and living a life with few available options. She falls in love with a man, a mercenary, who is out of her life when she is pregnant. Galina establishes a life with another man who raises Galina's child as his own. This film was seen in Romanian with Spanish subtitles. What did not need translating were the observations of life in a small town, and the presentation of presumed male entitlement. Irina Arms' Extreme Number is German film inspired by true events. Arms alternates between a narrative that takes place in 2004, and documentary footage of Chechen terrorist Shamil Basayev. Taking place in Berlin, a young Chechen refugee, imprisoned, gets involved with a young woman who serves as his translator. She helps him escape from prison only to find herself horrified to discover that he is part of an underground network, and is planning a suicide bombing mission. Most of the film is in German, with some Chechen and Russian, with Spanish subtitles. I could only do a very rough translation of a scene with philosophical implications that would figure into the latter part of the narrative. What any viewer could understand is the moment when the would-be suicide bomber makes his way into an embassy reception and hesitates once he is aware that there are children in the room. Mark John Ostrowski's Le Vrai Film est Ailleurs (The True Film is Elsewhere) is a Spanish film in French. The film centers on an older man, an expatriate, his son, and the the son's Argentinian girlfriend. There are various philosophical ramblings and symbolism, such as an American flag washed up on a beach. I'm usually a sucker for black and white films made in the 21st Century, but this is the kind of pretentiousness that gives art movies a bad name. If there is to be a Craft Film Festival in 2020, I would only ask that if it is still at Nau Bostik, that the enthusiastic Craft team make sure the screening room is warmed up first if needed. And also convince the food truck people to show up on Sunday.